The dates for the filling of online application form for UPSC 2019 have been declared. The preparation period has already begun for this most prestigious examination in India. I hope you have gone through the eligibility criteria, if not please click here to check if you are eligible for UPSC 2019 or not. Be very careful while filling the application form as a slight mistake can make you disqualified for the exam or the application form being rejected. You will be given some time frame for filling the application form but we recommend it to fill early as soon as the portal opens. This will help you get the test center of your choice. The online application form will be available over https://upsconline.nic.in. The website is best viewed in Google chrome, IE 9 and above. Make sure that you have these browser for online application submission. The application form has various modules and sections to capture the personal as well as educational information of the candidate. Make sure you that you filled all the details correctly before moving on to next page. Open your browser and log into https://upsconline.nic.in. 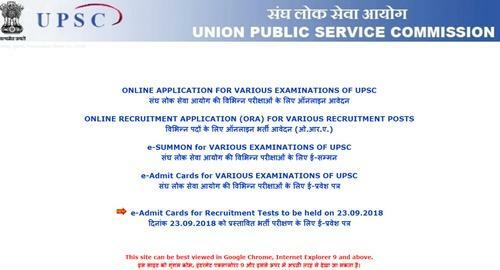 You will see the “online application” link for UPSC 2019. Now move your cursor to “Examination” menu and you will see two links getting displayed. One is “Part –I Registration “ and “Part-II Registration”. First click on “Part –I Registration”, it will take you to all the active examinations. Here you need to select for which exam you want to apply. Name: Mention the name as mentioned in your matriculation certificate. Please don’t use any prefix such as Mr., Mrs. or Ms. You may use it when you name is less than 3 characters as the minimum limit for the name is 4 characters. In the online application form, if your name reaches the default size of 30 characters, an additional field for filling the full name will appear in the form. The candidate may fill the name in the Additional Field as well. Full Name field has a capacity of 70 characters. Father’s Name: The candidate should not use any prefix such as Shri, Mr. or Dr. etc. Mother’s Name: The candidate should not use any prefix such as Smt., Mrs., Ms. or Dr. etc. Nationality: Select from “Indian” or “others”. For group A services only Indian citizens can apply. Physically Challenged: Select from “yes/No”. PH Category: you need to provide the category i.e. ortho, blind, Low Vision and Deaf-Mute. PH challenged Certificate date: you need to mention the date of issue of certificate. Community: Select from General/OBC/SC/ST. please not that the OBC applicants who come under the “Creamy Layer” are not entitled to claim for OBC reservations. They will be treated as General category. Minority: Click on Minority option in case you belong to minority. Fill out your educational qualifications and complete address details with appropriate email address and contact number. Then after filling page 1, its time for page 2. You need to provide information on IMA/ NA/ AFA and OTA. The preferences should be given in numbers 0-4. You need to select atleast one of them. As female candidates are only eligible for OTA, then they should select a number corresponding to OTA. The candidates, who want to join Air Force Academy, should indicate AFA as their preference. You also need to state that if you have or likely to have a NCC “C” certificate. Now it’s time to move to page three of the registration process. This page will display all the information which you have filled for verification. You can click on “Update” button which is found on the bottom of the page in case you went back and made any corrections. This is the last and final call where you can change your filled details. Make sure that you have filled all the details correctly as you may not get any chance to change the information provided by you at this stage. The system will generate a unique “Registration ID” along with the basic information of the candidate such as “name”, Father’s Name, Mother’s Name, DOB, email id and address which was provided by the candidate. This marks the completion of the Part I of the registration process. The candidates should note that the application will be marked as incomplete and will be rejected unless accompanied by the part II registration procedure. For a successful submission of the application, you need to fill the PART-II of the registration. You can take a printout of this page as it contains your DOB and Registration ID which are required at subsequent stages of the examination. The part-1 registration was to fill the details and for part-2 it’s the payment of the fees either online mode or bank challan mode. After completing part-1 of registration, the candidate moves to part-2. Here the candidate has to select “Agree” or “disagree” with the contents of the declaration statement. You need to select ‘I have read Declaration & Agree’ button. You can proceed further only after clicking on “I Agree”. For fee payment, a candidate has three options. First, the candidate can pay cash at any branch of SBI (State Bank of India) through the pay slip generated by the online application process. Second way is to pay online using the internet bank facility. Only the SBI users can make the payment only if they have internet banking facility. Third way is that, they can pay using any VISA/MASTER debit or credit card issued by any bank or institution. The allotment of centers would be on “first apply, first serve” basis. So, if you want your favorite or nearby center make sure that you apply early. When the capacity of the center is filled, the second preferred center will be considered. No request for a change of center will be entertained. Blind candidates will be required to give the examination at any one of the seven centers which are Chennai, Hyderabad, Delhi, Kolkata, Lucknow, Mumbai and Dispur. The candidates once admitted to the examination will be informed regarding the time table and the place or places of examination. You need to scan your passport size photograph and upload it in application form in JPEG or JPG format. The size of the photograph should be between 3 to 40 KB. You can use online tools or any image editing software to reduce or increase the size in case it is required. You need to scan your signature and upload it in application form in JPEG or JPG format. The size of your digital signature should be 1KB. You can use online tools or any image editing software to reduce or increase the size in case it is required. The complete procedure is online and students should make a note that there is no offline application form available. You can take a print out of the application form for your records and for further communications. No need to send it to the commission office. I hope you liked the article and it helped you in clarifying your doubts in filling online application form for UPSC 2019. We have tried to cover everything starting from filling basic information to payment details. Make sure that you fill the online application before the link gets off. We, at UPSCbuddy are working round the clock to provide our readers with the most latest and apt information on UPSC and the examination. Now there is no need to spent thousands of rupees over coaching and study material when it is freely available over the internet. If you think you are not strong hearted and cannot take the examination, then believe me, you must prepare for this examination. Who knows, India may get its finest IAS officer in you. Just believe in yourself and dare to dream as only dreamers are the only achievers. Nothing is possible without dreams. So, gear up and start preparing for UPSC 2019. All the details will be mentioned over https://www.upsc.gov.in and for filling the application form you will have to navigate to https://upsconline.nic.in/. Stay connected with us for all the latest information on UPSC 2019. If you have any query please feel free to comment below.